Toys that are good for your baby and good for the ?? ✔ Yes, please! Whether you're taking a step toward minimalism or on the hunt for natural, eco-friendly toys for your little one, we've got you covered. 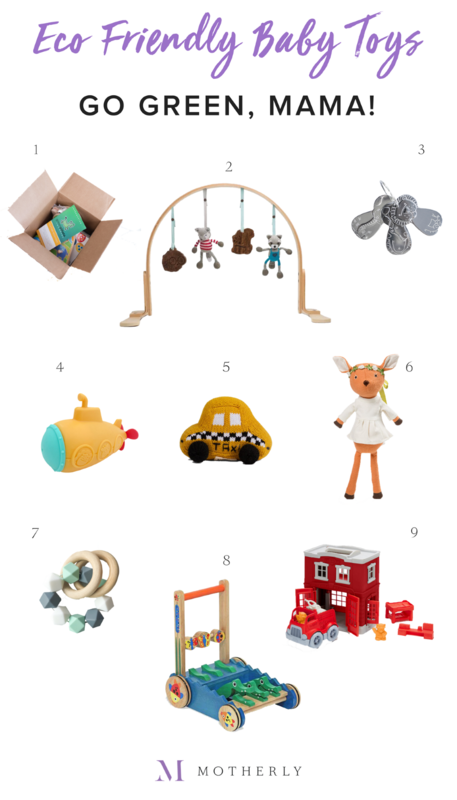 From toy shares and stuffed animals to teething rings and push toys, you and your babe will be the greenest around with these earth-friendly picks. Remember how your toddler just had to have that certain toy, then played with it for 15 minutes, then never looked at it again? Mmmhm, so do we. Enter Green Piñata. Perfect for the green, minimalist mama, this toy share service is the perfect solution for moms looking to be eco and clutter-conscious. We found the process to be quick and easy: simply choose age-appropriate toys (Green Piñata partners with manufacturers who use only sustainably-sourced wood or recycled plastic toys), play as long as you'd like, then mail everything back, free of charge, and wait for your next box. Genius! And yes, in case you're wondering, all toys are sanitized in between uses, so no need to add “other kids' germs" to your list of mom worries ?. Pro tip: You might be (pleasantly) surprised how basic, simple toys capture your child's imagination and truly encourage open-ended play. (And how much cuter they look spread all over your living room floor.) We definitely were. Say goodbye to shiny, gaudy plastic and hello to this simple, modern play gym from one of our faves, Finn + Emma. The frame is made from 100% birch wood and finished with non-toxic stains and lacquers, and the wooden and knit gym buddies are all completely eco-friendly. The knit dolls are fair-trade and hand-knit by artisans in Peru—how cool is that? When not in use, it's super easy to tuck away to the side of a room so it's not taking up half your living room. Win! Pro tip: The play gym buddies are all detachable and make great stroller or car toys. Kleynimals stainless steel teethers look, sound, and feel a lot like real keys, which is perfect because isn't your baby always after the real thing? We love them because they have no sharp edges like real keys, and they're made from medical-grade stainless steel, so they're much cleaner than the real thing. They can also be engraved! Pro tip: The cute animal shapes can also come in handy when baby starts learning animal and name sounds. These BPA and phthalate-free silicone toys from Marcus & Marcus are a fun, bright addition to any little one's bath time. Vibrant colors and simple designs encourage imaginative play, and some toys feature a temperature sensitive function that changes color when the bath water gets too hot. The best part? Each bath toy comes apart for easy drying and cleaning—hello fun in the tub, goodbye mold! Pro tip: For a good scrub, toss them right in the dishwasher for an easy, extra cleaning. These organic, non-toxic, handmade knit rattles from Estella are one of our go-tos for giving (and hopefully receiving!). They're made of 100% organic cotton, so you won't have to worry when your babe tries to stuff the entire thing into her mouth—which we can assure you, she will—and are perfectly sized for little hands. And have we mentioned the off-the-charts adorableness? Taxis and hamburgers and rubber ducks and hot dogs—come on! Pro tip: These rattles are a huge hit with older kiddos for imaginative role play, so don't pack them away after the first year. You guys, I dare you to go to this site and not audibly squeal with delight. Hazel Village offers organic cotton, hand stitched animals and dolls that are, oh, just possibly some of the CUTEST THINGS WE'VE EVER SEEN. The whimsical characters and incredible attention to detail will surely capture your child's heart—and yours. Pro tip: A full wardrobe of doll and animal clothes are also available, as are matching clothes for your little one, so dress-up options are endless! If plastic teething toys aren't your jam, head over to the gorgeous Feltman + Co. Etsy shop for a handmade wooden and silicone teething ring that is truly as beautiful as it is functional. The wooden rings are all natural and lightly coated in 100% organic beeswax, and the beads are made with food safe, BPA-free silicone. You now have permission to rest easy as your little one happily gnaws away! Pro tip: Never submerge the teether under water because the wood may warp; instead, clean using a mild soap and warm water. Pro tip: Remember that push toys, not walkers, are recommended for kiddos just learning to walk. We love pretty much everything about Green Toys, and we think you will too. Made from 100% recycled plastic—mostly milk jugs!—Green Toys save energy, help reduce our carbon footprint, and, most importantly, are fun. The simple designs inspire creativity and imaginative play. We're big fans of the fire station playset and the submarine. Pro tip: Every pound of recycled milk jugs saves enough energy to power a TV for three weeks. That's a lot of Daniel Tiger. We only include products we've tested and loved in MotherlyLoves. Through affiliate programs, we may receive a revenue percentage if you purchase through our website.